Take up your armour and pledge allegiance to your house with Red Flush Casino’s latest Video Slot! 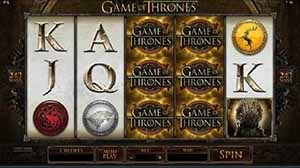 RED FLUSH CASINO :: Game of Thrones™ online slot – PLAY NOW! The hit HBO® series Game of Thrones℠ has captivated the hearts of fans across the globe, and now Microgaming is excited to be able to offer players a unique gaming experience with an all-new 5 x 3 Reel Game of Thrones™ Online Video Slot available in both 243 Ways and 15 Lines! Make sure you choose your route and your House wisely, as your allegiance could earn you up to 75 000.00 in the Lines game and 121 000.00 in the Ways game.